University of North Georgia students learn about volunteer opportunities during the university's Volunteer Fair, held each year on the Gainesville Campus. Hundreds of University of North Georgia (UNG) students sought volunteer opportunities from among nearly 50 organizations at the recent Volunteer Fair, an event that follows UNG President Bonita Jacobs' August announcement establishing the "Year of Engagement" at the university. 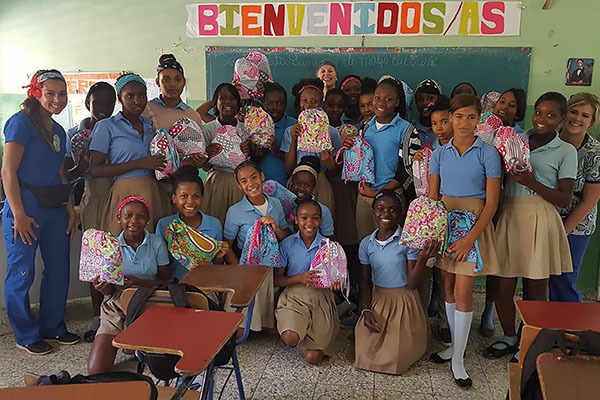 "This year will be marked by an increasingly productive exploration of our responsibilities to our students‚ our colleagues‚ and to our region. To highlight this shared sense of commitment and purpose as a public institution, it is only fitting that we designate the current academic year as, 'The Year of Engagement,'" Jacobs told faculty and staff at a semester-opening assembly. "As we have seen with our initiatives from last year, I know this deliberative approach will produce great results toward our continued success in teaching, scholarship and service." 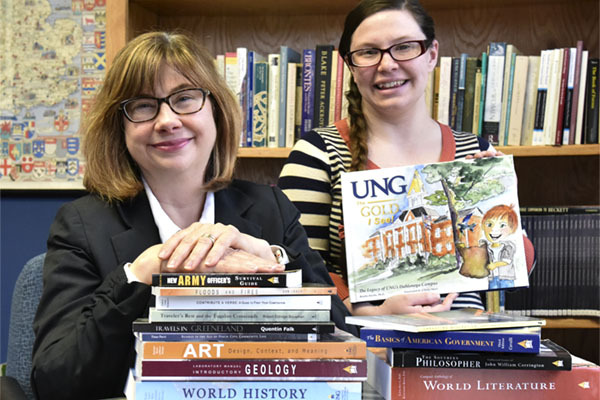 UNG is one of only two public universities in Georgia to earn the Carnegie Foundation’s classification for community engagement. 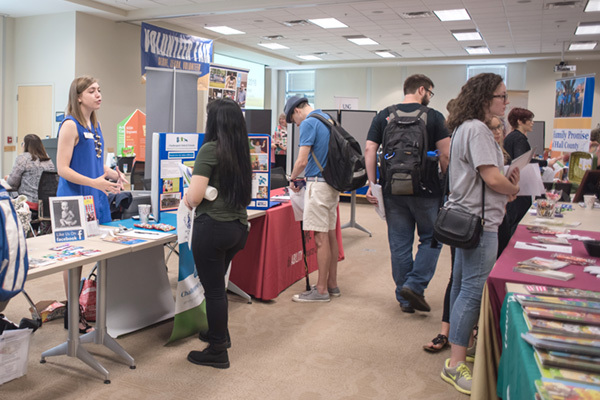 The Volunteer Fair, held on the Gainesville Campus for the fifth year, includes nonprofit, private and governmental community service providers. The event is the only one of its kind in the region and has grown steadily, according to organizer George Danns, a professor of sociology at UNG. "The 2014 Volunteer Fair highlights UNG's 'Year of Engagement,' an initiative to advance the University of North Georgia's missions of service, quality education and the development of students as leaders for a diverse and global society," Danns said. "The Volunteer Fair is part of a pedagogy of engagement that brings the community to the campus and takes the campus to the community. 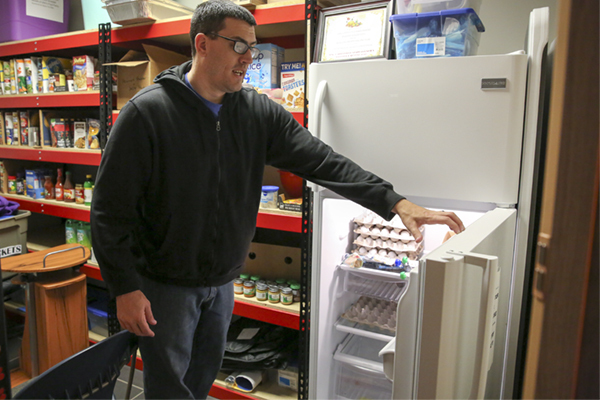 The fair also expands the economic impact of UNG in the community by availing participating agencies innumerable volunteer hours provided by our students." For participating groups like Hall-Dawson Court-Appointed Special Advocates (CASA), volunteers are vital to an organization's existence, said staff attorney Susan Rigdon. CASA is a state program that trains and supervises community volunteers who serve as advocates for children in foster care. "As someone who knows the importance and invaluable contribution that our volunteers make, it's just amazing to see everyone here today and, on behalf of the community participants here today, we're so grateful for this fair," said Rigdon, who also coordinates CASA volunteers. "All the organizations represented in this room know that volunteers are the heart and soul and we wouldn't be able to do anything without our volunteers." Dozens of students from Flowery Branch High School in Hall County also attended the 2014 Volunteer Fair. At the event, Danns thanked the organizations who participated in the fair, and the event's university sponsors: College of Arts & Letters; Center for Teaching, Learning and Leadership; Department of Sociology and Human Services; UNG Foundation Inc.; Student Government Association; and Non-profit Development Club.